Today we celebrate Natalie Portman’s thirty-fourth birthday with a mash-up of her two most famous roles: Queen Amidala in Star Wars and Nina Sayers in Black Swan. The Star Wars prequel trilogy grossed over $2 billion worldwide while Natalie won the Academy Award for Best Actress in 2010 for her performance in Black Swan. Anthony Brian Villafuerte has down a great job of mixing up details from both roles. 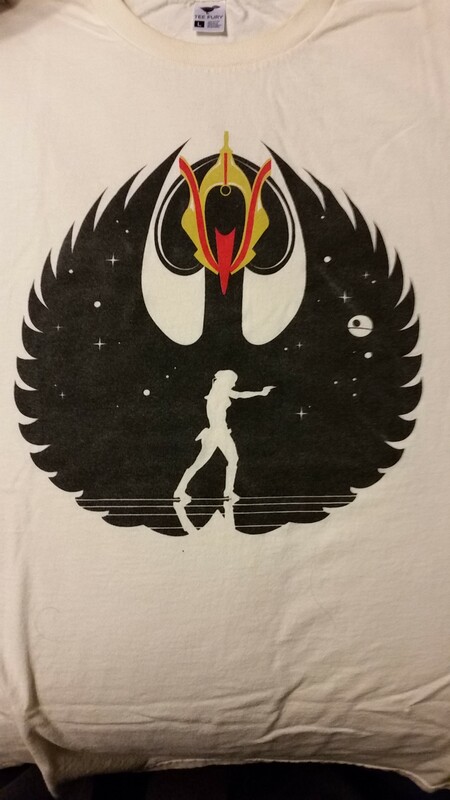 Queen Amidala’s headdress is on the head of the swan while the swan is shaped like the rebel bird logo of the Rebel Alliance. Inside the black swan, there is a starfield with an outline of Senator Amidala from Attack of the Clones. It would be cool if I could say I bought this shirt exactly four years ago today, but I purchased this shirt on TeeFury on May 9, 2011. That is four years and one month ago.